In my ongoing attempts to be a well-rounded human, I repeatedly try things I'm not 100% enthusiastic about at the onset. Once in a while, said things I'm not super enthused about wind up growing on me. Case in point: matcha. Trader Joe's dessertification of the earthy powdered green tea was a great excuse to give matcha another try. Well, okay, not this candy bar dessertification of green tea. Despite being a fan of white chocolate, that combo still sounds a little weird to me, and I'm glad Russ picked up a bar so I didn't have to. 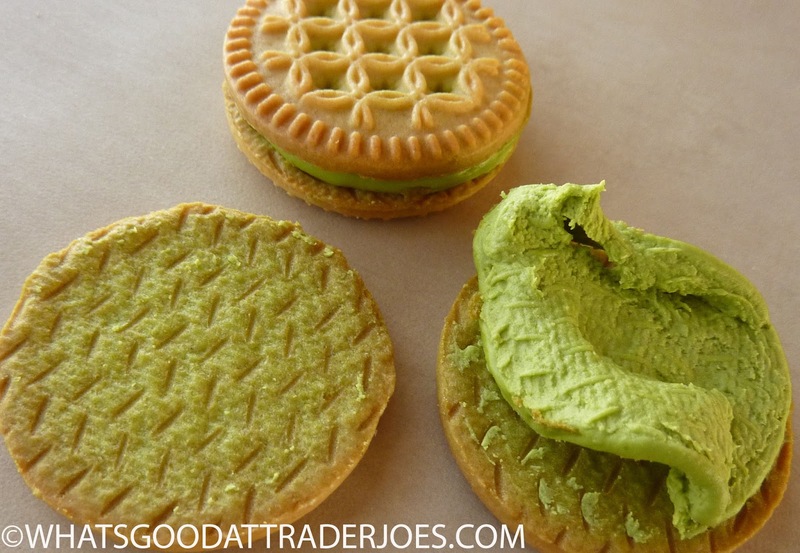 But matcha in sandwich cookies? That's just weird enough to work. If it worked with coffee, then why wouldn't it work with green tea? Will the matcha still fight cancer, lower cholesterol, boost immunity, reduce stress, and enhance my metabolism? Somehow, I doubt it. But I'm going to eat these cookies anyway. Upon first bite, you might not notice the matcha flavor. 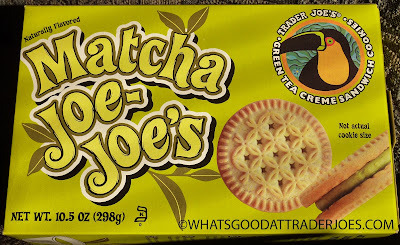 I mean, it's there, so you might notice it if you're really paying attention, but the vanilla cookies mute the earthy green tea taste to the point where even matcha-haters might be able to stomach this particular iteration of Joe-Joe's. For matcha lovers—if you want to prove to yourself that these cookies are well-worth their "matcha" moniker—return to your childhood by unscrewing the sandwich cookie and licking the creme center right off the cookie. Bam. It's sweet...but it's unmistakably matcha-y. I admit, it's weird that it works. But it does. Even for me, who, again, isn't super into matcha—it's so sweet that I can't dislike it. I'm going to surprise even myself here as I toss out three and a half stars. Matcha-liking Sonia will go with four.